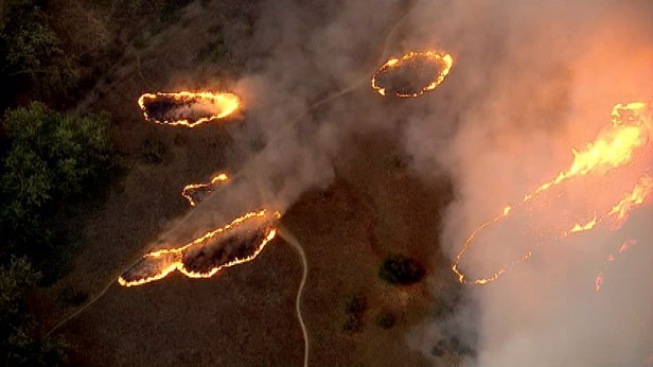 NBC Southern California's NewsChopper 4 captured this dramatic image of fire rings dotting the southern flank of the Springs Fire on May 2, 2013. A huge Southern California wildfire burned through coastal wilderness to the beach on Friday, then stormed back through canyons toward inland neighborhoods when winds reversed direction — even as another separate fire broke out in the hills of Glendale near Los Angeles. The wind shift forced fire commanders battling the Springs Fire, which has been raging since Thursday, to order a new evacuation of homes in a Thousand Oaks neighborhood along a two-mile stretch of road overlooking smoke-filled coastal canyons. Fears arose after gusty Santa Ana winds from the northeast faded and ocean breezes from the southwest pushed inland. The "worst-case weather scenario" sent flames ripping through fresh fuel just to the east of where the blaze charred wildlands a day earlier, said Ventura County fire spokesman Bill Nash. "In the perfect scenario we'd just hope for the wind to go away but what happened is the wind just turned around," Nash said. The wind-whipped fire erupted Thursday in the Camarillo area, threatening as many as 4,000 homes but only damaging 15. No injuries were reported. The 28-square-mile blaze 50 miles east of Los Angeles was only 20 percent contained, NBC 4 Southern California reported, and the work of more than 900 firefighters, aided by air tankers, was just beginning. Evacuations had been lifted overnight for neighborhoods as the fire moved toward the coast. California State University, Channel Islands remained closed, and new evacuations were called for scattered homes in coastal canyons, Nash said. Those areas mainly included ranches, orchards, camps and vacation homes rather than dense neighborhoods. Some expensive ridge-top and canyon homes also were in the path of the flames. Fire engine crews took up positions to defend the dwellings as helicopters made water drops. The fire was 20 miles west of Malibu, burning mostly in rugged mountains. Nash said it was not moving toward Malibu as of midafternoon. Earlier, it jumped the Pacific Coast Highway at Point Mugu and burned on a beach shooting range of Naval Base Ventura County. The base ordered an evacuation of a nearby housing area as a precautionary measure and urged personnel in other Point Mugu housing to voluntarily leave. The fire reinforced predictions that California is in for a bad summer fire season because dry winter and spring weather has left brush tinder-dry. In addition, the California Department of Water Resources found the water content in the snowpack was just 17 percent of normal. The snowmelt is a vital water source for the state. More than 3,000 firefighters were battling six major wildfires on Friday in California, the state fire agency said. Fire crews have responded to more than 680 wildfires since the beginning of the year — some 200 more than average for the period. Hot, dry Santa Ana winds gusting to 50 mph or more swept flames from the Camarillo-area fire toward the coast on Thursday. Cooler, calmer ocean air was beginning to move ashore on Friday and could send the humidity soaring — the beginning of change that could even bring a chance of rain in the fire area by Sunday night or Monday morning. The change pushed relative humidity at Camarillo from just 3 percent to 19 percent in an hour. The temperature hit 96 then fell into the low 80s. Smoke that had been streaming offshore began stagnating over the fire. The National Weather Service canceled mountain wind advisories and predicted onshore winds of only 10 mph to 15 mph, with some 20 mph gusts. That raised concerns of flare-ups along the path of the fire. "The fire can jump up at any time and any place," Tom Kruschke, a Ventura County fire spokesman, said earlier. "There's that hot bed of coals out there covering thousands of acres." Overnight, the fire roared down a canyon in Point Mugu State Park and through an evacuated campground, but firefighters managed to protect a nature center and other buildings. 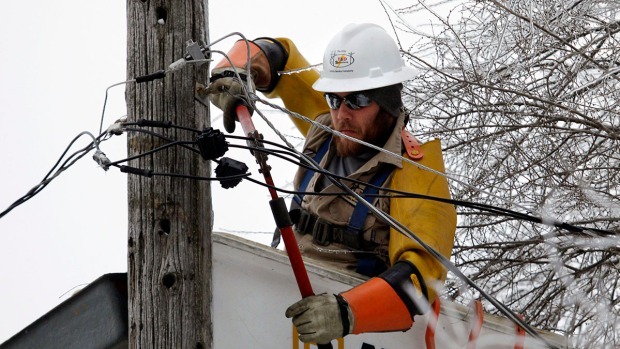 "We had 20-, 25-foot flames. They were having a devil of a time making a stand," said Craig Sap, a state parks supervisor for the district. "We had a moment of calmness, maybe a wind shift, and they were able to get a line around it," he said. "I don't think a single picnic bench burned." Elsewhere, a 4 1/2-square-mile blaze that destroyed a home burned for a third day in mountains north of Banning, 85 miles east of Los Angeles. It was 65 percent contained. In Tehama County in Northern California, the size of a wildfire north of Butte Meadows was revised down from more than 15 square miles to 10 square miles, state fire spokesman Daniel Berlant said. The fire, which was 10 percent contained, was burning in a remote area and wasn't posing an imminent threat to any structures. Elsewhere, crews expected to fully contain a 125-acre blaze in Sonoma County and a 200-acre fire in Glenn County on Friday. Containment of a 55-acre Butte County fire was expected this weekend.